Artist Tamás Jakus has envisioned some pretty amazing motorcycles in the past, my personal favorites being the CHAPPiE bike and his Rocketriumph. His latest design is equally as awesome – an imperial cruiser dubbed the Jakusa Equus Kylo. 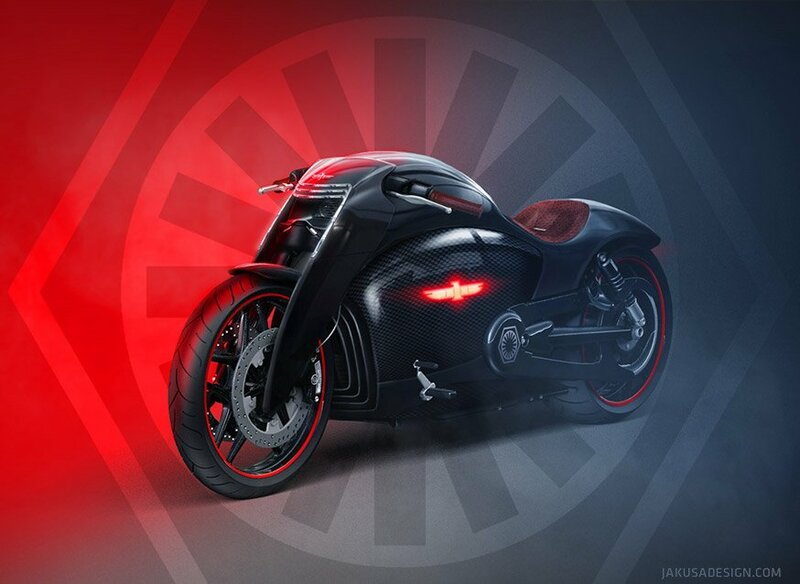 The design is clearly inspired by the ominous outfit of The Force Awakens’ bad guy Kylo Ren, complete with a dark, horizontally-barred helmet design up front, and cool black and red accents around the sleek and futuristic bike. Even the (presumably) carbon fiber body is patterned to look like Ren’s coat, and the red illumination is just like his lightsaber’s. If the Empire had these on Hoth instead of speeder bikes, I bet they would have won.